Just a few weeks ago Minnesota Lynx forward/center Taj McWilliams-Franklin joined Rice University on the sidelines to begin her duties as an assistant coach. The Lynx reached the WNBA Finals for the second straight year but the Indiana Fever won the championship on October 21. Two weeks later McWilliams-Franklin, a 13-year WNBA veteran, arrived in Houston. “Mama Taj” averaged 8.4 points and 5.4 rebounds in addition to starting 33 of 34 games for the Western Conference Champions last season. Tuesday night, the Owls lost to the defending national champion Baylor Bears 89-49 in front of 2,318 fans at Tudor Fieldhouse. The Lady Bears had no problems with the Owls and started the game on a 7-0 run. They led 46-17 at halftime. No. 3 Baylor (6-1) now leads the series between the two teams 19-17. Baylor has won the last six meetings in the series, all of which have come since the breakup of the Southwest Conference. Houston native Brittney Griner led Baylor with 35 points, 9 rebounds and 4 blocks. She has now scored in double-figures in 87 straight games and in 117 of 119 in her career. She received a standing ovation from the Baylor-packed crowd when her name was called during team introductions. Brooklyn Pope scored 17 points and pulled down 7 rebounds. Destiny Williams contributed 12 points and grabbed 10 rebounds. Baylor’s All-American point guard Odyssey Sims did not play. Since the team lost to Stanford in the Rainbow Wahine Classic tournament in Hawaii on November 16, she has missed four games. She strained her left hamstring four minutes into the game against the Cardinal. Jessica Kuster led Rice (2-4) with 18 points and 13 rebounds. Christal Porter scored 11 points and grabbed 7 rebounds. Zoe Rogers finished with 10 points. Rice hosts McNeese State on Saturday, Dec. 1 while Baylor travels to face No. 5 Notre Dame in South Bend, Ind. next Wednesday, Dec. 5. The game will be televised on ESPN2. 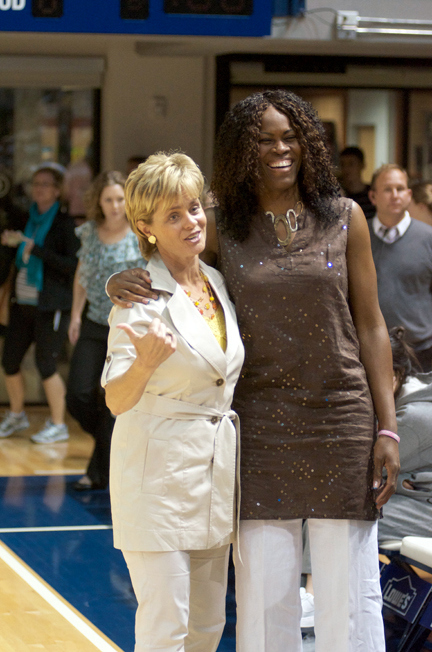 November 27, 2012 (Houston, Texas) – Baylor head coach Kim Mulkey and Rice assisstant coach and Minnesota Lynx player Taj McWilliams-Franklins. The Lady Bears defeated the Owls 89-49. Photo copyright Robert Franklin, all rights reserved.